Carly Crouch Picture: Jon Hewson www.communitypix.com.au d481761. MANDURAH cafe owner Carly Crouch was “devastated” to hear Mandurah had been snubbed by Uber Eats who have “no current plans” to launch the food delivery service in the Peel Region. “Mandurah gets excluded as always but it would be nice if they tried,” Ms Crouch said. Uber Eats currently delivers between Success in the south to Currambine in the north; southern suburbs Mandurah, Rockingham and Armadale are excluded from the list. 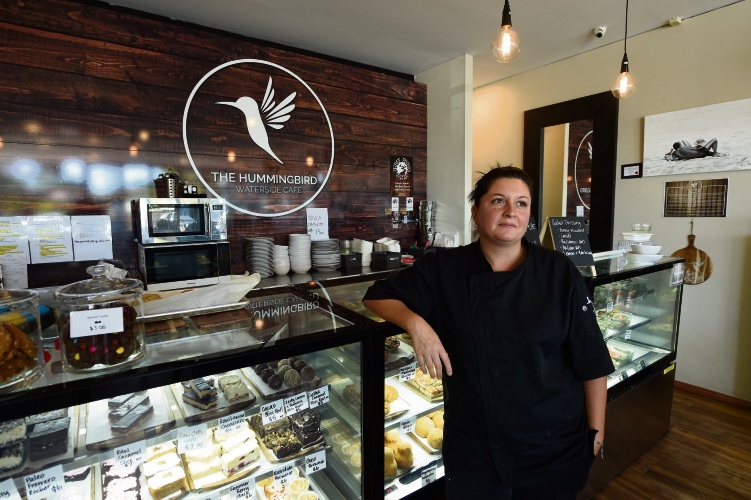 The Hummingbird Cafe owner said if the food delivery service was available in Mandurah, she would “definitely” use it for her business. “Anything to assist my business is good and there’s nothing detrimental about Uber Eats,” she said. Mataya Eatery owner Natalie Cameron believed there was demand for the service in Mandurah. “If the proposition came about it would be very easy for us to turn the delivery service on in our business as our food is takeaway style and our packaging is designed to be grab and go,” she said. Paparazzi restaurant owner Damien Messineo said he wouldn’t utilise Uber Eats because “they pay too much commission”. An Uber Eats spokesperson told Mandurah Coastal Times its services wouldn’t be offered in the Peel Region at the moment. “While we have no current plans to launch Uber Eats in Mandurah, we’ll continue to closely monitor demand in the area,” they said. Map of Perth and the northern and southern suburbs where Uber Eats offers its services. Ms Crouch said her business would allow customers to order her cafe food from apps MenuLog and Skip, but Uber Eats would make the delivery of food a much easier task for her staff. “Having Uber Eats would mean my staff wouldn’t have to leave the building to deliver food,” she said. “I would have another staff member on to deliver orders from MenuLog, and sometimes MenuLog would be only $50 which is fine but I can’t afford to have another staff member on for five hours to cover one MenuLog order. Peel Chamber of Commerce and Industries General Manager Andrew McKerrell said hospitality businesses were incorporating delivery services, like Uber Eats, for their al-a-carte menus. “These new services are providing those who may want restaurant meals, but may not be able to physically go to a restaurant still benefit from the restaurant’s offerings,” he said.